Our intern in the northeast, Daniel Salazar, is a busy man. In addition to attending school and working for Willy Phillips at Full Circle Crab Co, he spends one day a week providing valuable outreach for the federation to Latinos. Daniel has connected us with a youth group named Juntos. Juntos means “Together” in Spanish. 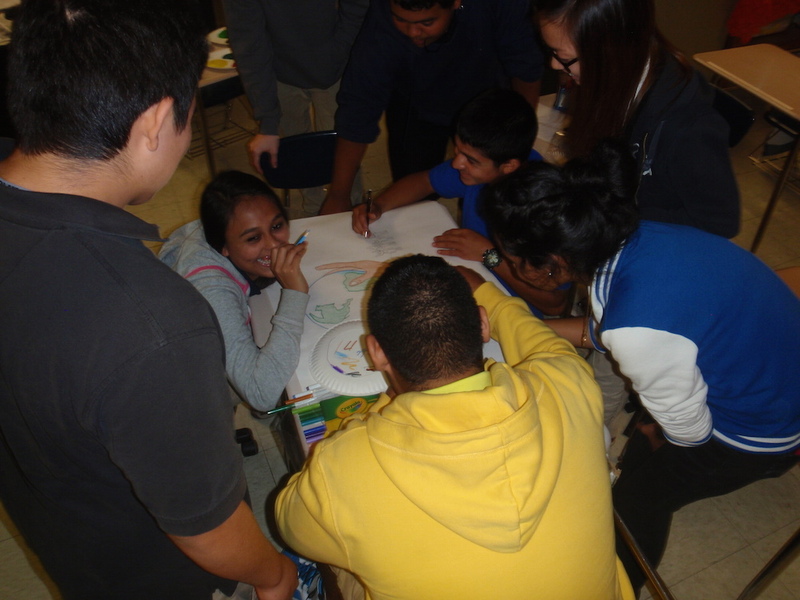 The group works to unite community partners to provide Latino 8-12th grade students and their parents with knowledge, skills, and resources to keep youth engaged during high school and to encourage families to work together to gain access to college. It’s a great group providing powerful services. We provide Juntos youth with hands-on science experience and expose them to natural resource careers options they might not otherwise know. Juntos members provide us volunteer labor, original ideas and lots of laughs. 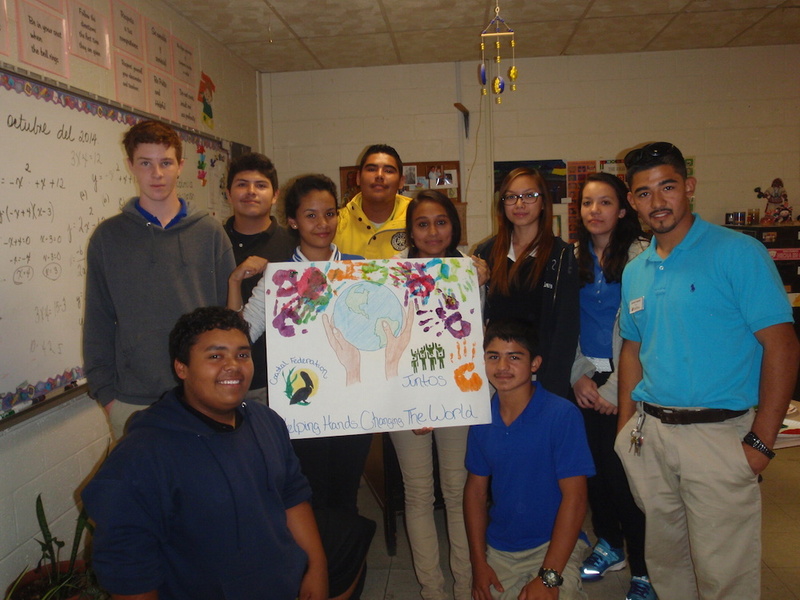 The partnership Daniel has started with the federation and the Juntos club from Columbia High School is titled ‘Together We Make a Difference’, or in Spanish, ‘Juntos Hacemos la Diferencia’. 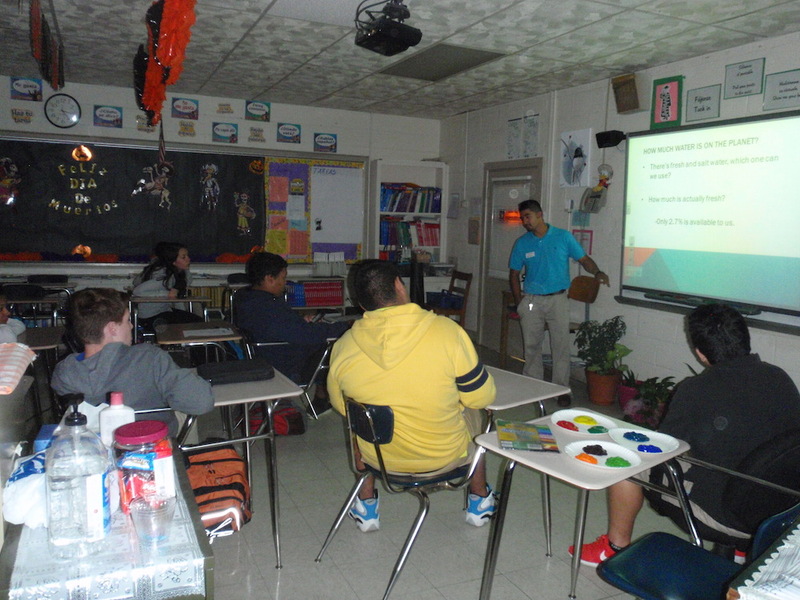 The students knocked on the doors of various residents and businesses, where each member of Juntos had the opportunity to describe the project in vivid detail. They began by introducing Juntos and the Coastal Federation and explaining the goals of the project, describing how this will help the community and improve the quality of the local rivers by reducing stormwater runoff. They concluded by asking each resident if they were willing to participate in this project by having the project team redirect a downspout on the building to a vegetated buffer or by installing a rain barrel on site. There is no cost to participate in this stormwater runoff reduction project thanks to support from the Outer Banks Community Foundation. After building a list of the interested participants, the project team worked on prioritizing which resident or business would benefit the most from implementing these LID methods. After checking the budget, it was confirmed that it will be feasible to install an LID method on all the sites of each interested participant. The club members will come back later in the spring to complete the installations. 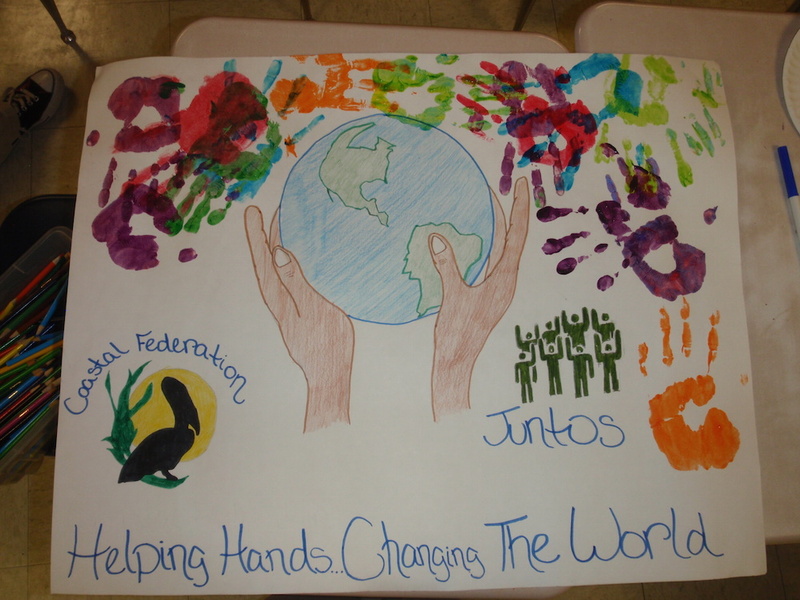 On May 2nd, Juntos from Columbia High school and the Coastal Federation implemented the last step of the project “Together We Make A Difference”. The sun was shining and the birds were chirping it couldn’t have been a better day to install Low Impact Development methods throughout Tyrrell County. The participants were thrilled to know they were going join the movement aimed at protecting our coast and keeping our local water quality as clean as possible. Juntos members along with Erin Fleckenstein and intern Daniel Salazar installed a total of 10 rain barrels throughout the community. They gave a special recognition to the Community Foundation grant for making all of this possible. It was a fun day full of excitement and a step closer to making this world a better place! As a part of the “Juntos Hacemos la Diferencia” or “Together We Make a Difference” collaboration, Daniel Salazar, N.C. Coastal Federation’s Northeast office intern invited the local Juntos group to Dare County and introduced them to some new Low Impact Development (LID) methods. They began by visiting the northeastern office of the N.C. Coastal Federation where they learned about numerous LID techniques, such as rain barrels, cisterns and permeable pavement, as well as how each is used to filter and redirect polluted stormwater runoff before it reaches vital water sources. The Salt Water Wetland Project, installed at the mouth of Shallow Bag Bay, was also presented and of particular interest to the group because they are familiar with tearing down natural habitat for development, but not tearing down buildings to develop natural wetlands. They learned that wetlands work as the first line of defense in keeping bacteria, sediments, and nutrients from being released into the canal that feeds the Shallow Bag Bay. 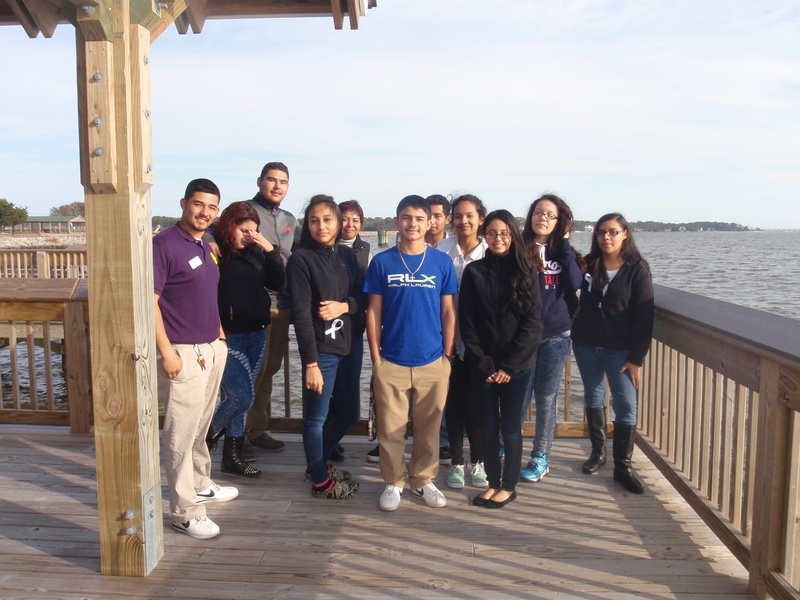 The Juntos group next toured the Roanoke Island Aquarium. Here, they had the opportunity to see how LID methods can vary in size depending on how much water is being use. The aquarium for instance, uses a large cistern system to recycle rainwater that holds up to 10,000 gallons. Any overflow from these cisterns is directed towards a rain garden so it can be absorbed with very little runoff draining into the adjacent sound. The participants were excited about the potential of the LID methods to be installed in their homes and community, as part of a greater project that is being planned.